THE lament of a lone bagpiper accompanied rag-and-bone man Alf Masterson to his final resting place on Tuesday. As the sun blazed down, mourners packed the street outside his former home in Montpelier Grove, Kentish Town, to watch his coffin begin its slow journey to Golders Green Crematorium. 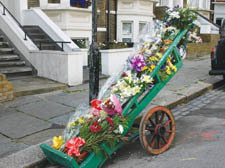 Many had laid wreaths and bouquets earlier in his wooden handcart, still parked outside his home of nearly 40 years, in poignant tribute to him. The old-fashioned “totter” – one of London’s last rag-and-bone men and a much-loved face around the borough – lost his battle with cancer in the Marie Curie Hospice in Hampstead last Saturday. Among the mourners at the service were Alf’s 90-year-old mother, Anne, his wife Phyllis, and their children Damian and Siobhan, as well as friends and family who had come from all over the country to pay their last respects. Many wept as tributes were paid to Alf and songs were played by two of his favourite artists, Elton John and Rod Stewart. Daughter Siobhan said her father had kept his amazing strength of character to the end. “He was proud, kind, caring and above all, a fellow human being,” she said. At the traditional wake in The Gloucester Arms pub in Leighton Road that followed, friends and family swapped favourite memories of Alf.